Being revealed today is the Terrifying Trees Set. This creepy set is the 4th and final set to be revealed for our upcoming Kickstarter launching this Wednesday the 25th! 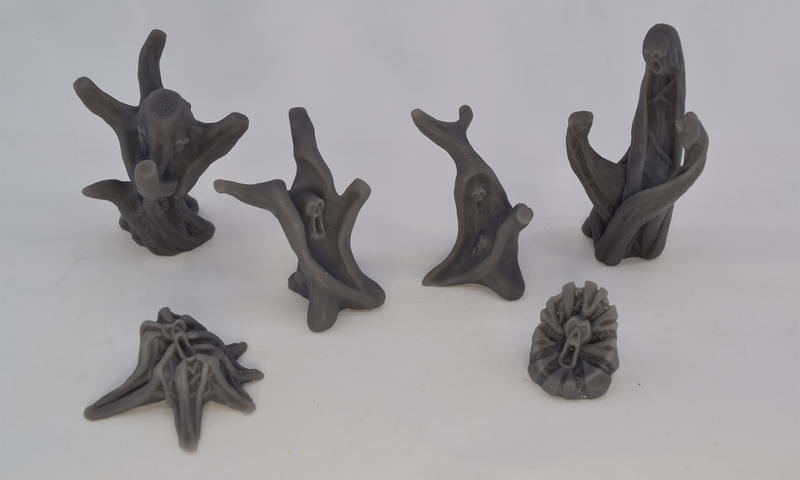 The Terrifying Trees Set contains six different sculpts of haunted trees. The aim for this set was to create miniatures that can bring the often used forest or woodlands setting to ghostly life. Whether it be for a tabletop RPG, strategy game, or just a miniature diorama, these miniatures will transform a forest into a spooky character of its own. Made to pair with the previously revealed Screaming Stones Set, together they can transform any setting into something from a nightmare. The designs of the Terrifying Trees miniatures were split in three directions, with each direction being represented by two of the six miniatures. In order to keep a varied look, and to make the set more versatile, we focussed on creating distinct differences in the designs. The first two of the trees are rotting stumps with skulls protruding from the centre, these are perfect for a swamp setting, giving a feeling of decay. Two of the trees are petrified husks split apart by fire or lightning with skulls looking out from their exposed centres, perfect for an crumbling desert ruin. The final two trees are gnarled and ancient, covered in twisting bark and roots with multiple skulls on them, looking as if they have been alive for centuries in a constant state of corruption. The mix of design choices made for this set makes them versatile for dioramas and terrain, as well as possible enemies in your games. We scale the trees to be small sized in a 28mm scale setting with the tallest tree standing 45mm high, however these sculpts are packed full of fine details that would make them look amazing if scaled up to any size when printing your own! Be sure to check back on the 25th when our Kickstarter goes live! You will be able to get your hands on the STL files to print yourself, or on some high quality resin prints printed on our Form 2 SLA printer!